It was not all that long ago – just a few years, as hard as that it is to believe – that Europe appeared to be the part of the world most closely resembling the end-of-history idyll depicted by Francis Fukuyama at the end of the Cold War. Democracy, prosperity, and peace all seemed firmly entrenched. Not anymore. Parts of Paris are literally burning. The United Kingdom is consumed and divided by Brexit. Italy is led by an unwieldy left-right coalition that is resisting EU budget rules. Germany is contending with a political realignment and in the early phases of a transition to a new leader. Hungary and Poland have embraced the illiberalism seen across much of the world. Spain is confronting Catalan nationalism. And Russia is committing new acts of aggression against Ukraine. In what by historical standards constitutes an instant, the future of democracy, prosperity, and peace in Europe has become uncertain. Much of what had been widely assumed to be settled is not. NATO’s rapid demobilization after the Cold War looks premature and precipitous. There is no single explanation for these developments. 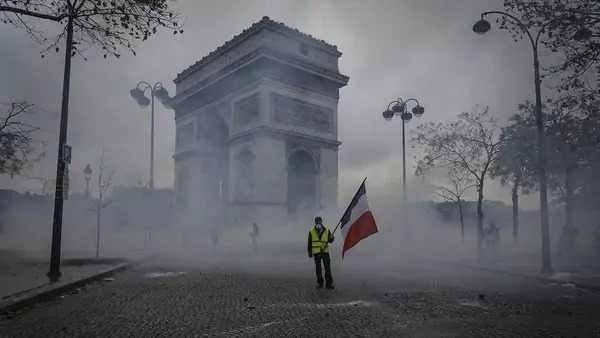 What we are seeing in France is populism of the left, the result of people having difficulty making ends meet and rejecting new taxes, whatever the justification for them. This is different from what has fueled the rise of the far right across Europe: cultural defensiveness amid local and global challenges, above all immigration. The European Union, for its part, has gradually lost its hold on the public imagination. It has been too remote, too bureaucratic, and too elite-driven for too long. Meanwhile, renewed Russian aggression may simply reflect President Vladimir Putin’s judgment that, having realized large political returns on his previous military “investments” in Ukraine and Syria, he had little to fear or lose from further actions. Europe’s political class deserves its share of responsibility for today’s growing disarray. The EU introduced a common currency without a fiscal or banking union, making it all but impossible to conduct a coherent economic policy. The decision to put the UK’s continued EU membership to a popular vote, while allowing a simple majority to decide the issue and failing to spell out the terms of departure, was misguided. Likewise, opening Germany’s borders to a flood of refugees, however pure Chancellor Angela Merkel’s motives, was sure to trigger a backlash. Most recently, French President Emmanuel Macron did himself no favors by backing down to the “Yellow Vest” protesters and offering compromises more likely to fuel additional demonstrations and exacerbate his country’s budget predicament. We should not assume things will get better. It is only a matter of time before France’s far-right National Rally (formerly the National Front) and political parties across Europe figure out how to combine economic and cultural populism and threaten the post-World War II political order. Italy’s hybrid populist government is a version of just that. The UK will remain torn over its relationship (or lack thereof) with the EU no matter what comes of Brexit; and it is entirely possible that a post-Brexit UK might come under serious strain itself, given renewed calls for Irish unity and Scottish independence. There is no formula for dividing power between Brussels and capitals that would be acceptable to both the EU and national governments. Meanwhile, it is far from certain that Putin is content or done with his aggression against Ukraine or conceivably others. Moreover, in a world of increasing inequality, violence within and between countries, and climate change, the pressures posed by immigration are more likely to worsen than fade away. And economic dislocation is bound to intensify in a world of global competition and new technologies that will eliminate millions of existing jobs. Why this matters should be obvious. Europe still represents a quarter of the world’s economy. It is the largest constellation of democratic countries. The last century demonstrated more than once the cost of a breakdown of order on the continent. Alas, just as there is no single cause that explains Europe’s increasing disarray, there is no single solution either. To be precise, there is no solution of any sort. There is, however, a set of policies that, if adopted, would help leaders manage the challenges. A comprehensive immigration strategy that balances security, human rights, and economic competitiveness is one such policy. A defense effort that focuses more on how money is spent than on how much is needed would go a considerable way in buttressing Europe’s security. Moreover, deterrence should be strengthened by bolstering NATO and further arming Ukraine. Weaning Europe from Russian natural gas makes sense as well, which implies halting the Nord Stream II pipeline that is meant to bring gas directly from Russia to Germany, bypassing Ukraine. And additional retraining programs are needed for workers whose jobs will disappear as a result of globalization and automation. Much of this agenda would benefit from American involvement and support. It would help if the United States stopped viewing the EU as an enemy and NATO allies as free-riders. Europe includes the countries most prepared to work with the US to deter Russian aggression; integrate China into global trade and investment frameworks on terms consistent with Western interests; mitigate and, where necessary, adapt to climate change; and set rules of the road for cyberspace. Alas, such an approach is unlikely to be forthcoming from Donald Trump any time soon. That leaves Europe with no choice but to confront its disarray mostly on its own.